As my baby girl desperately reaches towards my keyboard, trying so hard to assault my computer and drool all over it, I never do forget how tiny and fragile she once was, and how long and it took to finally get her home with us. I have always wanted to give back to the hospital somehow, the NICU or the ICN. As Mother’s Day approaches, I will never forget how last year at this time, we were visiting her in there everyday. How Mother’s Day was her true due date, and how she came way too early. I still struggle to forgive and forget how it was somebody else’s decision to take her out. I still hang onto some of those feelings, which I need to learn to let go. I didn’t get to choose when she came (do we ever?). But did she really have to come out so early? Did my doctor truly believe she was in danger? Did she really have to suffer such an early birth? AHHHHH I need to get over it, but it’s really hard!!! We attended a lecture recently on PTSD, it was given at our Mended Little Hearts meeting. PTSD is now recognized as a valid medical condition for parents whose child suffers a “life threatening event”. Our guest speaker said it is possible to suffer from symptoms of PTSD and not actually have PTSD. We most definitely have suffered from the symptoms, but gratefully it never was a full blown condition. My heart still quickens sometimes when I encounter triggers. Last week at the MRI I felt a touch of panic, memories. It’s my own journey to learn to overcome these things. I will be very hopeful that this year, my Mother’s Day, will be full of great memories instead of what happened last year. But all of this has also been brought on by the fact that I made this picture up finally to give to the NICU/ICN. 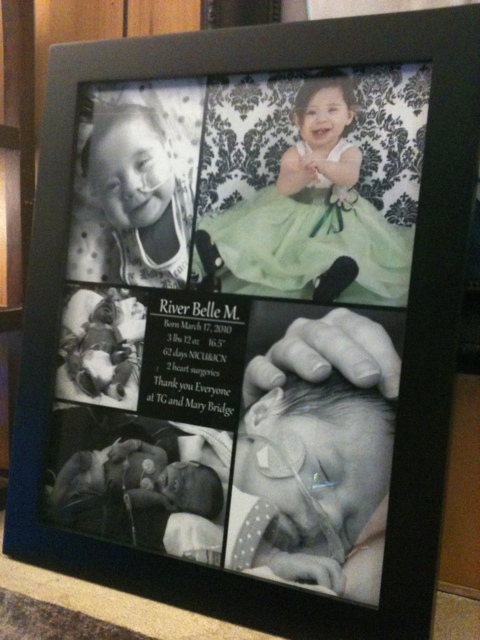 There were such pictures, all around both the NICU and ICN hallways that were given by parents, drawings, or photos of their children. Some letters, and short stories also. Sometimes they expressed gratitude, even though their child didn’t survive. Most of the time they expressed gratitude and photos of the child getting big and healthy and leaving the hospital! The pictures in the ICN, the stories of success, I did look at while I was there, and they did give me a sense of hope. Pete and I have always wanted to give one of these, and hope that it hangs somewhere where is might give a stressed out parent a little hope. Also to thank the many staff member, nurses and doctors, that helped to ensure River’s success. It’s all done and ready to go! Next week I will call up our old case manager and arrange a time to bring it by and, of course, show off River! And hopefully, get a sense of closure, maybe I can learn to move on from those memories of fear and panic and trauma, and learn to feel the peace and gratitude in it’s place!